These reusable, security key wallets, are ideal for use as an aid to key control and security. Size 230 mm x 152mm, available from stock as below in two versions. 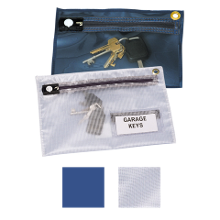 One with a blue PVC back and clear front, the other featuring a clear label pocket with an all round translucent finish. Both include a tamper evident zip lock, used in conjunction with either plain, colour coded, or sequentially numbered security seals. Item # KW1= Blue back, clear front - £5.25 ea excl VAT and carriage. Item # KW2= Translucent with window - £6.75 ea excl VAT and carriage.